In April 2016 Past-President Gunnar Kahlmeter and Treasurer Cornelia Lass-Flörl will complete their terms on the executive committee, while Professional Affairs Officer Evelina Tacconelli will stand for re-election after completing her first term. You will be able to select two (2) new members representing clinical microbiology and one (1) representing infectious diseases. 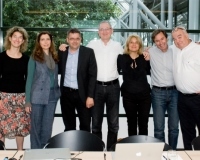 The 2015 online election for the ESCMID Executive Committee will close Monday, 14 December 2015 at 12:00 noon CET. The 126 applications are evaluated by three peer-reviewers independently. To achieve this, some 150 peer-reviewers are currently busy doing one to maximally five reviews. We are grateful for all their commitment and look forward to supporting the selected projects. Please check your user profile on the ESCMID database. In order to receive only the information you want we kindly ask you to take a few minutes to review and update your preferences if necessary. Please follow the link to the login form and your personal ESCMID profile. We want to encourage microbiologists to fill in a survey by the Federation of European Microbiology Societies. The study’s objective is to strengthen the profession, and to inform microbiology students about career identities and perspectives. Findings will be presented in 2016.